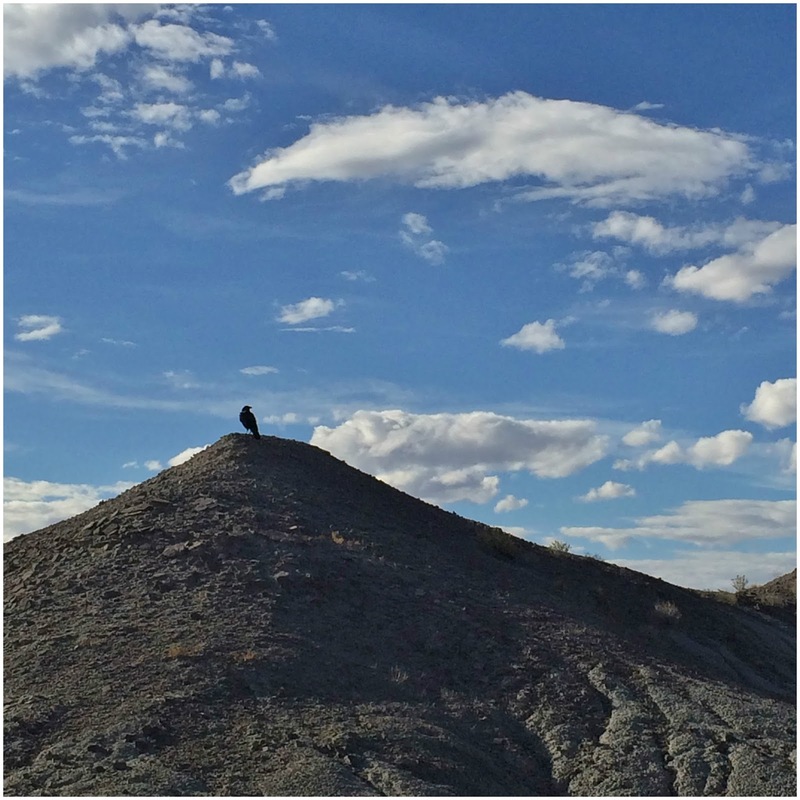 We headed to Sun Valley, AZ on October 28, 2016. 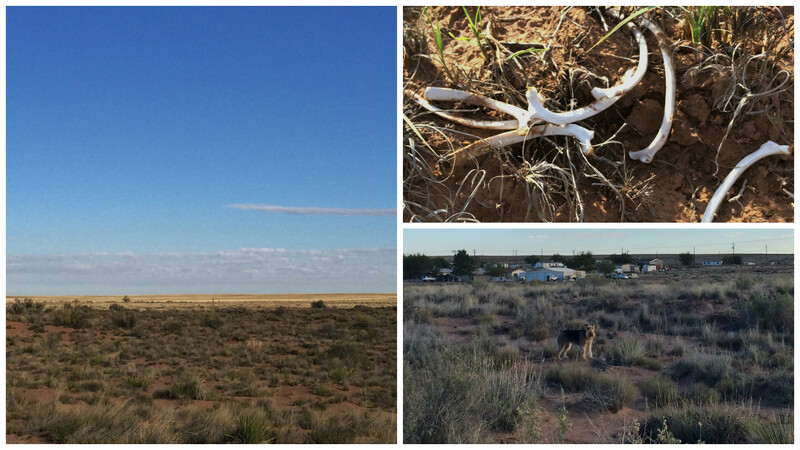 We stayed at the Sun Valley RV Park, which is right off of I-40 but surprisingly quiet. The RV park, a few houses and a knife store are all there is in Sun Valley, which explains why the mailing address is Holbrook. It is a small park, all gravel and the sites are very tight. It was hard to walk in between our slide out and our neighbors. They do have a nice community room that is open 24-hours and the laundry room was clean. Across the street from the park is a big open field that was perfect for letting Mielikki run off lead, except for the morning she scared Nancy half to death when she chased a young coyote. She did come back when called, much to Nancy's relief. She also found some old bones to play with. The WiFi was spotty, the Verizon signal on our phones was weak, but our Jetpack worked okay. We paid $20.68 a night with our Passport America discount. 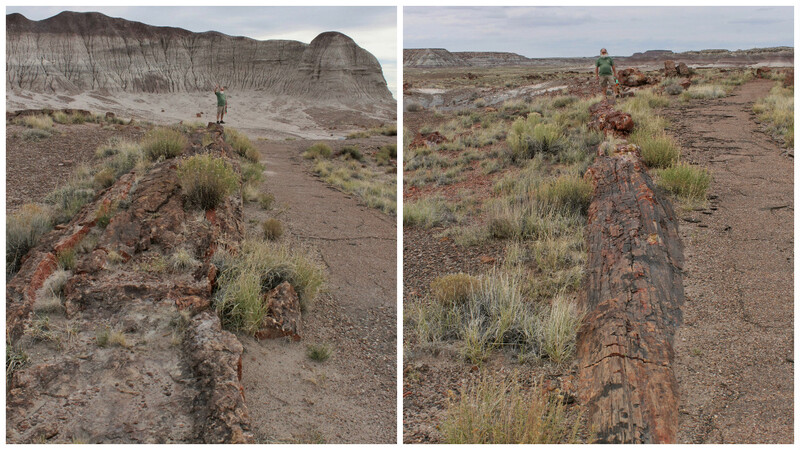 The Petrified Forest National Park was just 30-miles down the road. We spent two days exploring it. 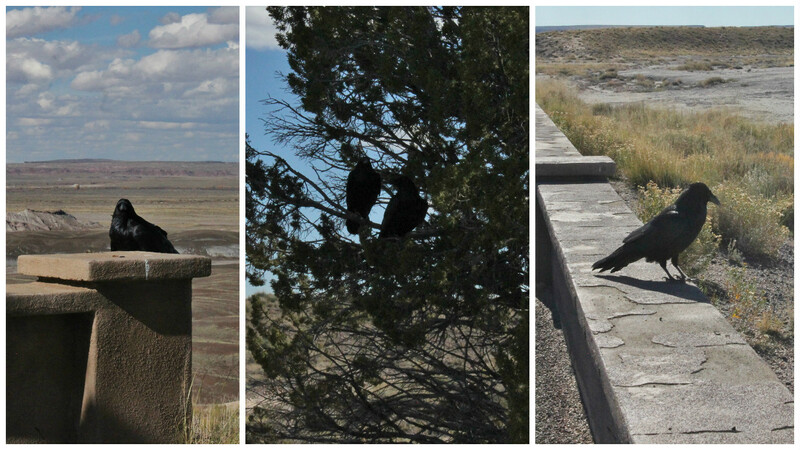 The first day we drove through and stopped at all the overlooks and exhibits. The second day we went back and hiked some of the trails. This park covers 50,000 acres and includes the Painted Desert. I-40 crosses through the center of the park and while driving on it you have no idea what beauty lies just a short distance on either side. 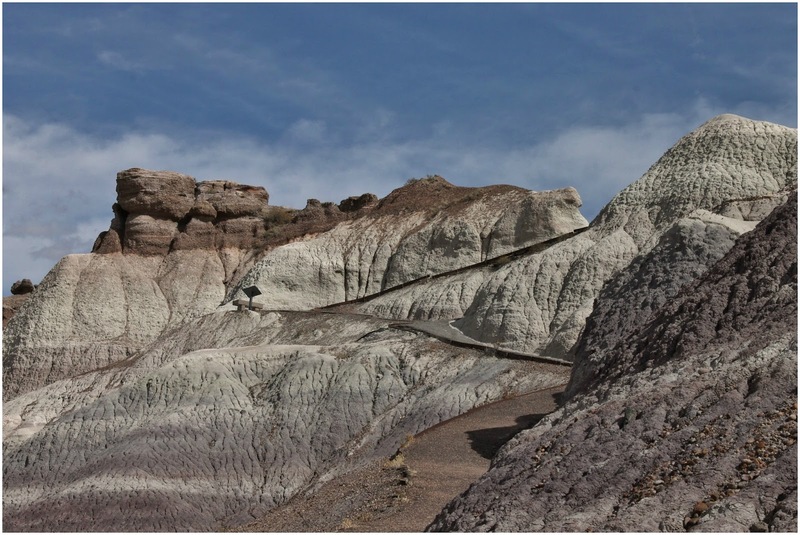 You start your journey at the Visitor Center and then follow the road through the Painted Desert with over looks along the way that offer breathtaking views. 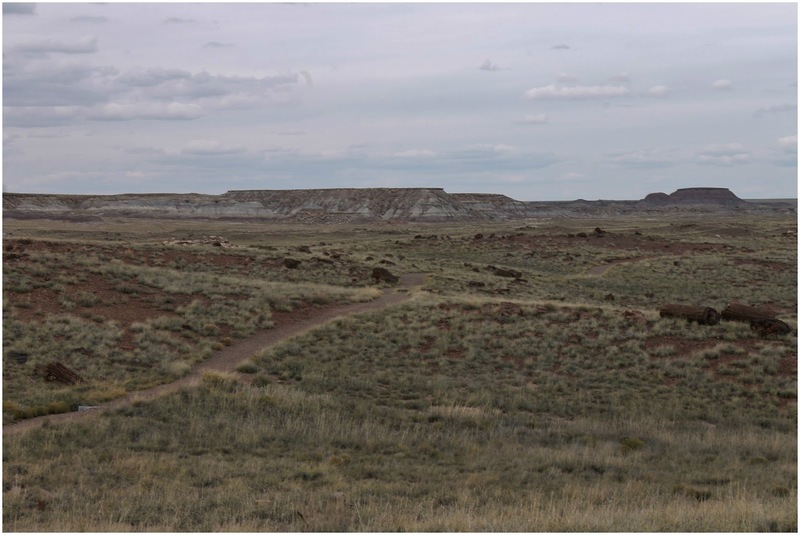 The 1-mile round trip Painted Desert Rim Trail takes you from Tawa Point to the Painted Desert Inn and gives you spectacular views. lodge and cabin complex. It is now a visitor center with historical information of the area. It was built by a C.C.C. crew and artisans between 1937-1940. Post-war revisions were made by architect Mary Jane Colter and it was operated as a Harvey House from 1947-1963. She was the chief architect and decorator for Fred Harvey Co. from 1902-1948. 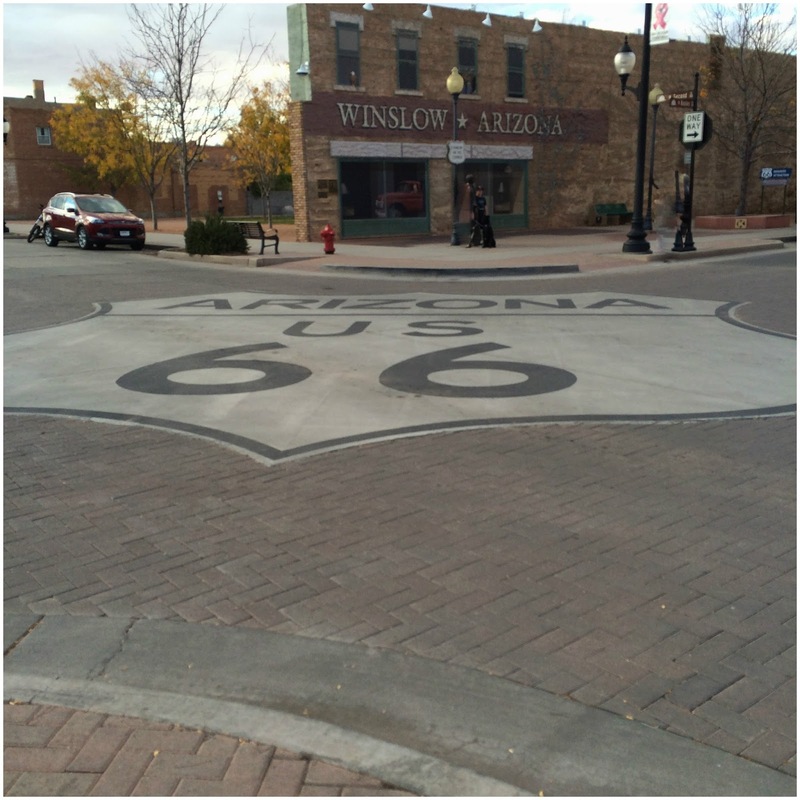 The original Route 66 ran through the park, the road is no longer open to the public and is now a park service road. 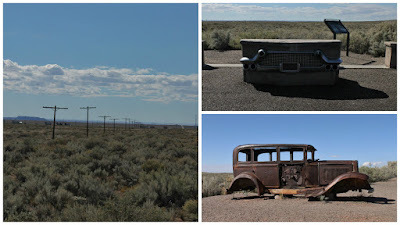 The original electric poles still line a portion of the road. 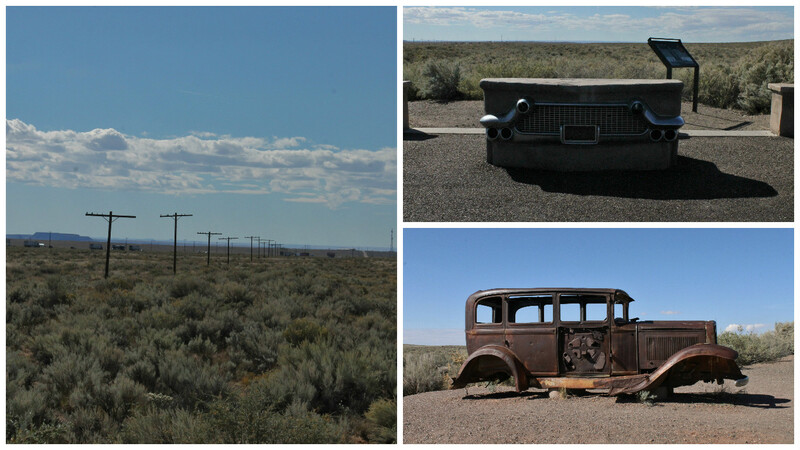 They have a monument to the route with a plaque and an old car. Once you cross under I-40 you enter the Petrified Forest and at first it doesn't seem like there is much to see but wow, are you in for a treat. 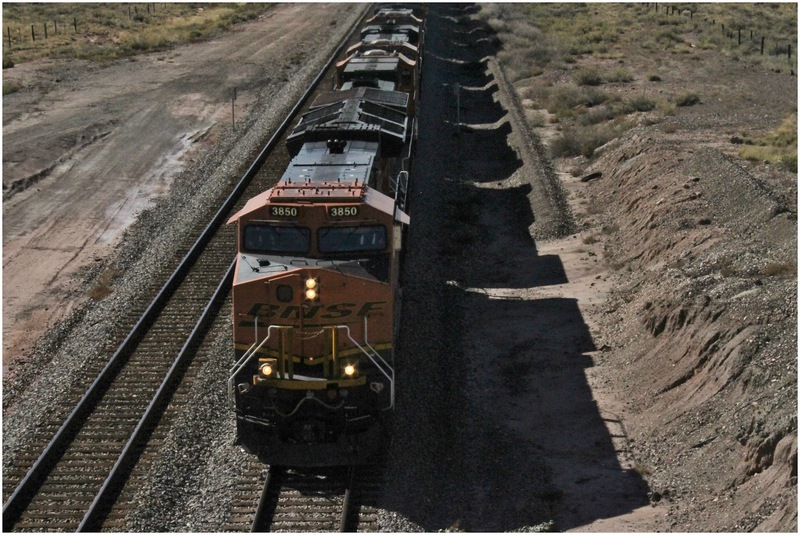 The first thing we came to is a bridge over the Santa-Fe railroad track and as we were approaching it we could see a train coming. Nancy walked out onto the bridge to take pictures. She was getting a video when it went under the bridge and force of the air knocked her off her feet! We always think of our son-in-law Steve when we are around trains. 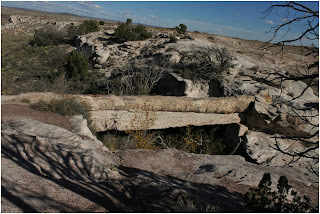 There is a walking path that takes you through Puerco Pueblo where you view ruins and petroglyphs. It is so interesting seeing these ruins and learning about the people who lived here. This was a 100+ room village occupied from 1250-1380 AD. 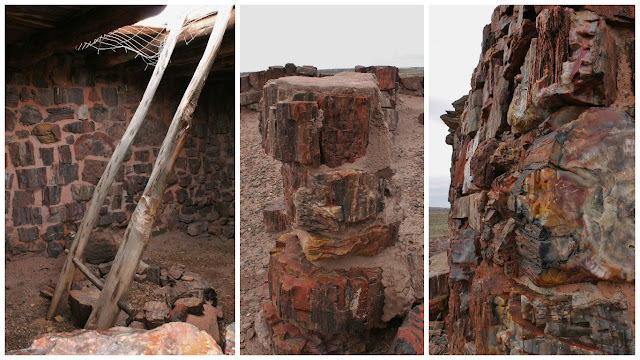 The photo to the right is a Kiva, it was a large round room built into the ground, access was through a hole in the roof. It was used for special ceremonies and where the men wove the ceremonial sashes. 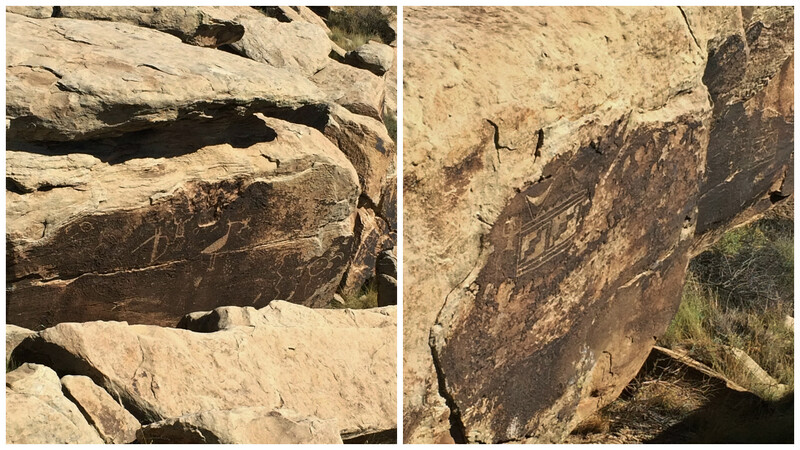 We loved the petroglyphs, these are some of the best we have seen. So fascinating to see them. 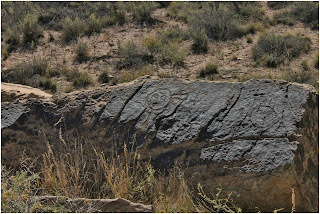 We as people have always wanted to share our stories, we've come along way from carving into rock. The next petroglyphs are at the Newspaper Rock overlook. 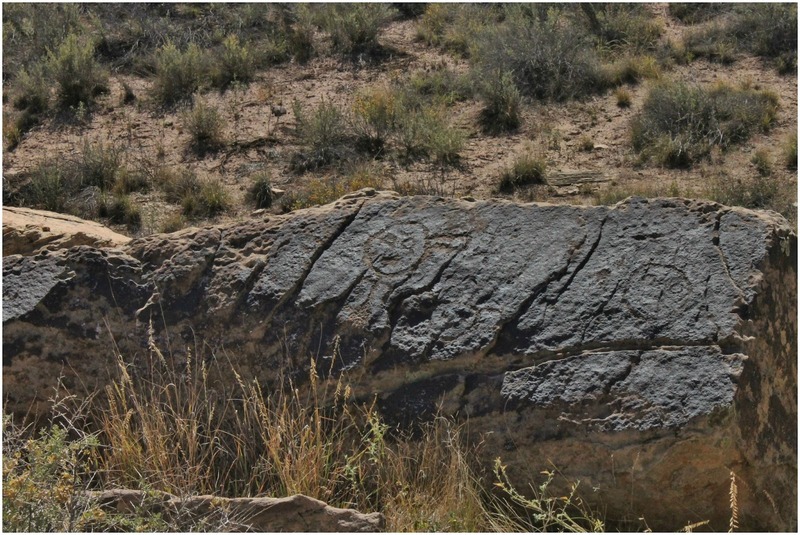 Over 650 petroglyphs cover a large boulder, some as old as 2000 years, unfortunately you can only really seen them though the telescope at the overlook. Click on the link to see pictures. 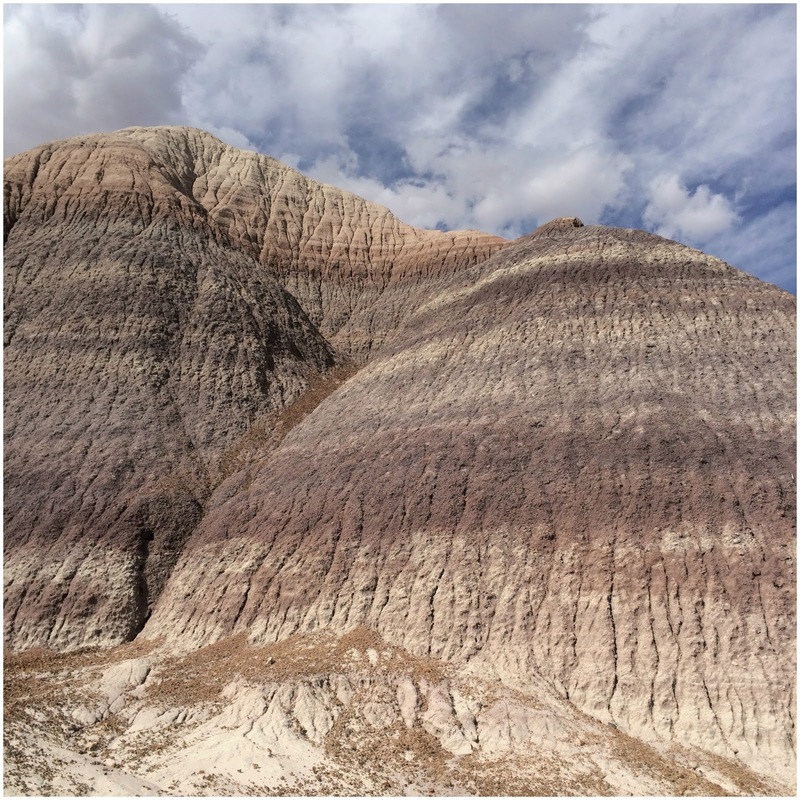 After leaving Newspaper Rock you drive through what is called the Tepees. 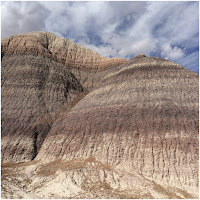 Beautiful mounds with amazing layers of color. The Blue Messa was our favorite place. 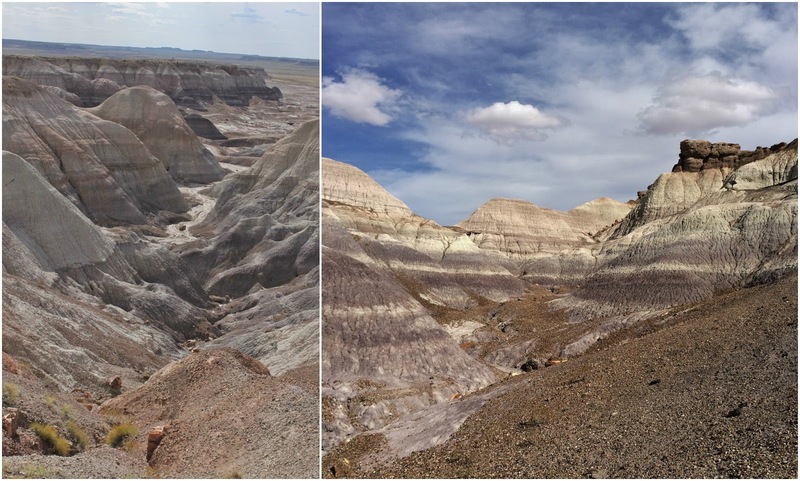 After driving through we knew we had to come back and hike the 1-mile loop trail. 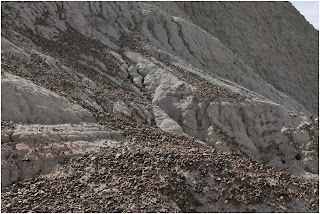 The trails slopes down to the floor of the badlands where you are surrounded by such immense beauty. The colors change with the sun so every turn in the path gives you something new to see. In spots you can see where the next layer is starting to erode and the dips in the hills are filled with petrified wood. The fact that you can get so close is pretty exciting. 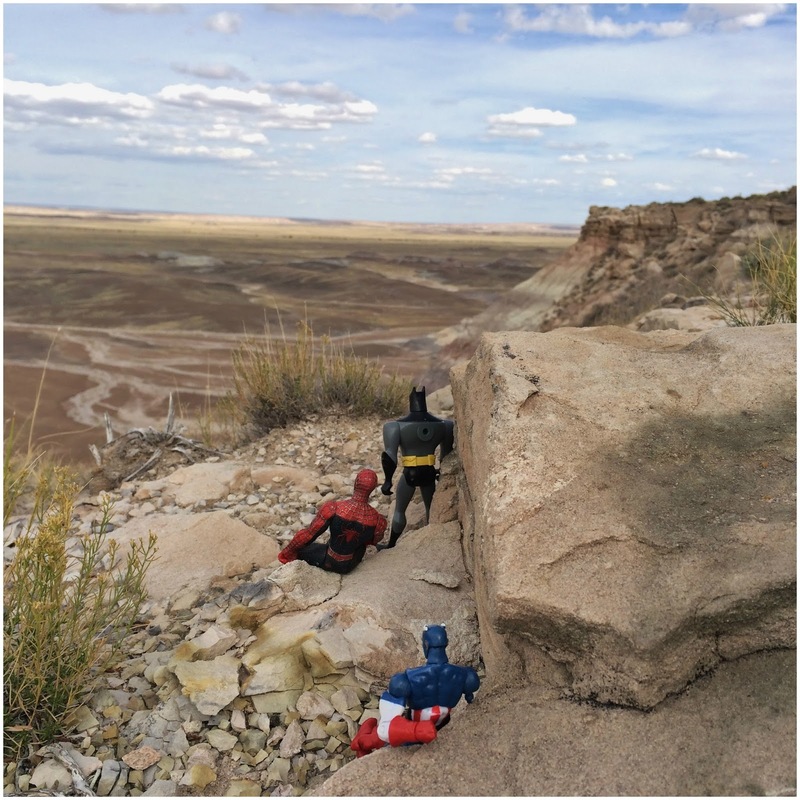 Our travel companions, Captain America and his friends enjoyed the views and so did Mielikki. The trail is all asphalt which makes it easier, but the incline that takes you to the floor is pretty steep so going down and especially coming back up can be a challenge. While stopping for a rest on the way back up we met Sue Loos who is from Alaska and traveling to the Phoenix area for a warm winter. We had a great conversation and shared travel stories and hope to catch up with her again down the road. The Agate Bridge is a 100-foot petrified log that crosses over a gully. At one point you could walk across the bridge, but the practice has been stopped to preserve the log. 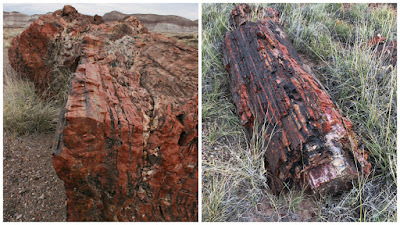 The beauty of the petrified wood just cannot be explained and the pictures don't even really do them justice. In a few spots you can see logs popping through the dirt as the mounds erode. 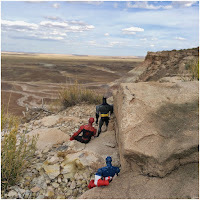 We hiked the 2.6-mile, Long Log and Agate House trails. Some of the logs have cracked in almost perfect sized sections, making it look as if they were sawed into pieces. Some of the trees, or logs are well over 100-feet long. 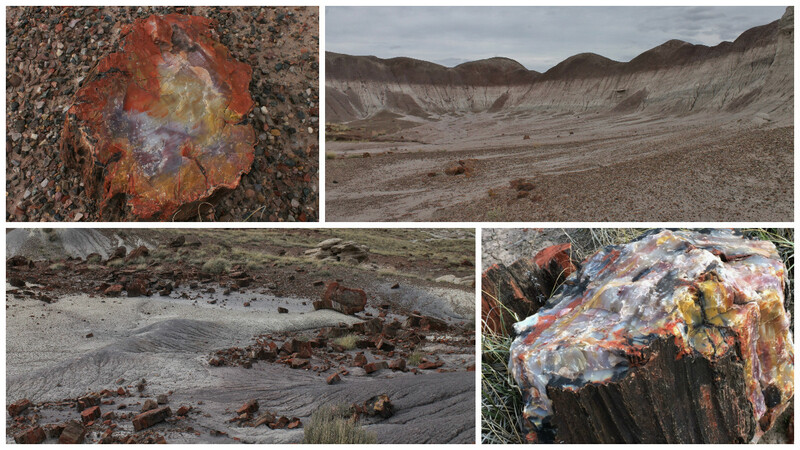 Every color of the rainbow and then some show up in the crystallized wood. We couldn't stop oohing and awing and pointing to a new piece we saw. 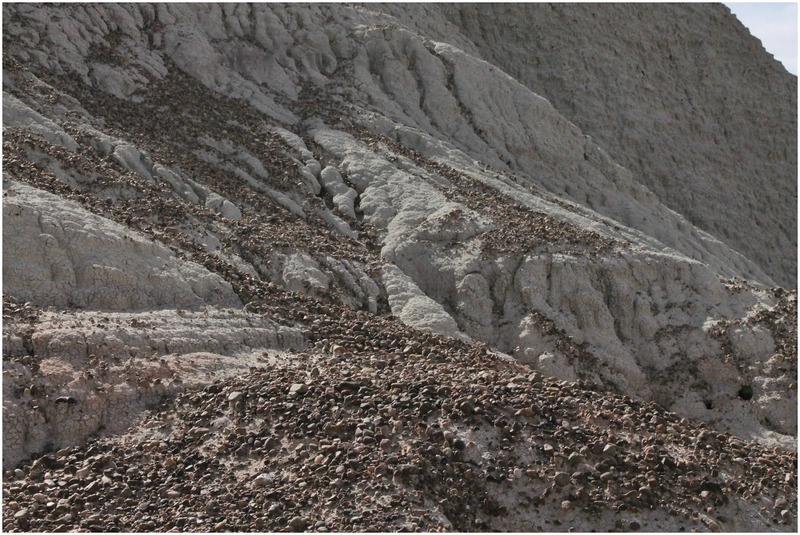 There is a section that resemble the badlands of the Blue Messa, it just pops up in the middle of the flat land you are walking along. We loved seeing the logs that still had the bark on them. Some you can still the rings of the tree - just so cool. The Agate House just blew us away. We thought at first that it had been built by the C.C.C. crews when the park was developed. 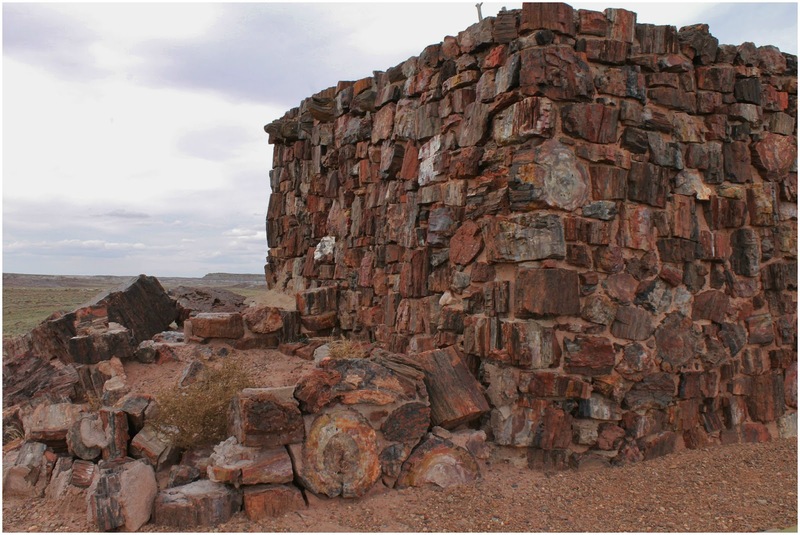 Imagine our surprise to find out it is was built sometime between 1050 and 1300, during the Late Pueblo II-Pueblo III Periods. It is believed to have housed one family, and may have served as a gathering place for the village. It appears to be an 8-room dwelling, large for its time. Entry was through a ladder in the roof. 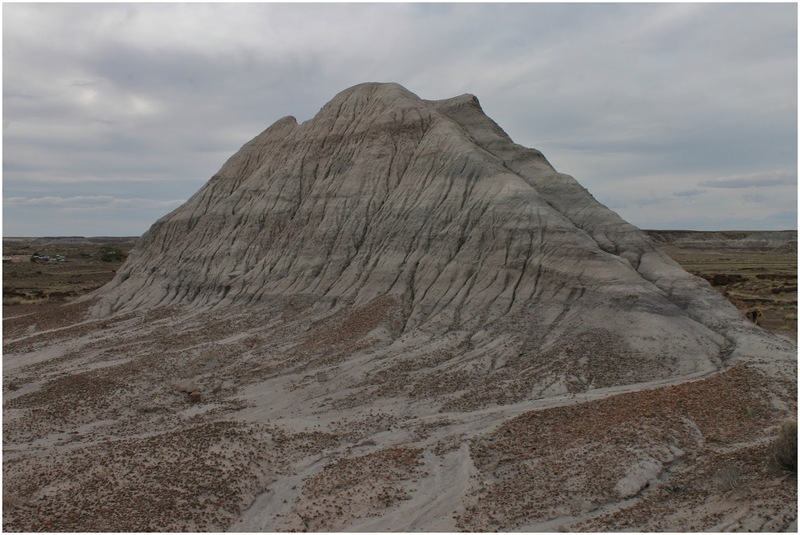 When it was discovered in the 1930's it was thought to be unique, but since then hundreds of similar structure sites have been found in the park. On both of our days in the park our tour guides were Black Ravens. Nancy has had a relationship with crows and ravens for many years. They show up in the oddest places just to say Hi. Here was no exception. Every stop had at least one if not more. As we drove one would fly just ahead of us, land in a tree or on a rock till we caught up and then fly ahead again. Yes, we know this all sounds very strange but it happens to us all time. 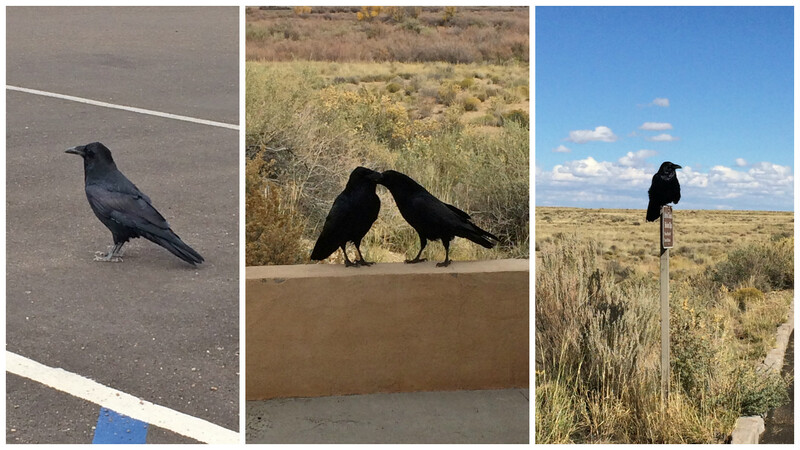 When we set up at a new place it is not uncommon for one to land on the picnic table and crow for a few minutes. This is one place that really needs to be seen in person, words and pictures can give you a feel for it, but just can't do it justice. There is very little of Route 66 left in this area, even the road for the most part is gone. We did pull ourselves away from the park to explore what we could find of the old Route from Holbrook to Winslow. 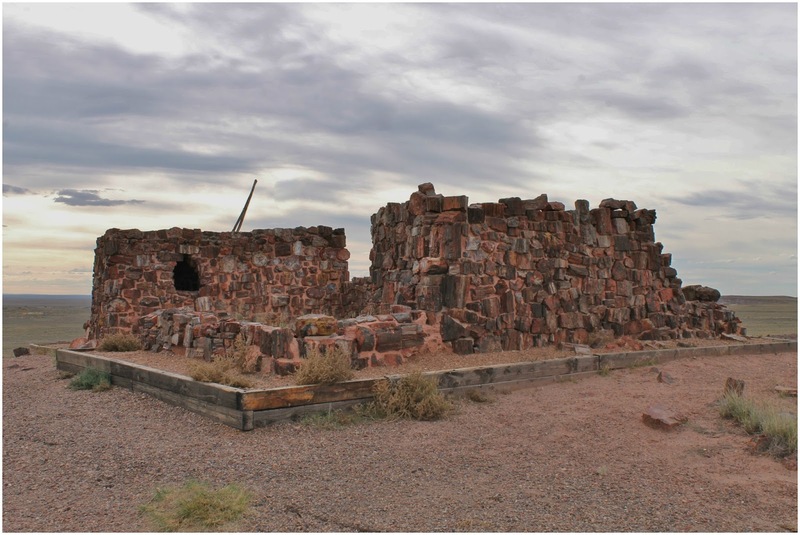 Holbrook and the surrounding area is known for their Trading Posts. 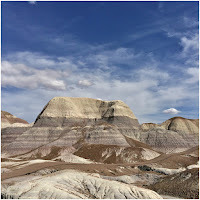 The stores have Indian artwork, along with numerous other items and the yards are filled with petrified wood and numerous dinosaurs. Stewart's was the craziest. 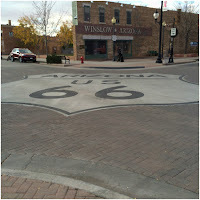 We found ourselves standing on a corner in Winslow, AZ. There is a small park commemorating the song "Take it Easy", written by Jackson Browne (one of Nancy's favorite artists) and Glen Frey, and one of the Eagles most popular songs. Muralist, John Pugh and sculptor, Ron Adamson created the space. The mural even has an eagle in the upper left window. The statue was put in place in September and is a likeness of Glen Frey who passed away earlier this year. Our drive back to camp one night gave us another beautiful sunset and a Halloween chuckle from the Road Commission. Next up is Phoenix and a week with family. - There is more than one way to clean a toilet. Well, actually we were cleaning the holding tank, but by the time we were done with the spray hose, the whole bathroom was clean! This handy gadget is a flexible hose that has a multi-spray nozzle on the end. So when you place it down in the holding tank (it is important to get it all the way down before you turn the water on) the water sprays all the walls of the tank. For obvious reasons this is a good idea and for us we hoped to get the water level meter working so we would know when the tank is full or empty. Our meter has been stuck, and it seems more than one cleaning is gonna be needed. Even after the meter is working we will continue to do this regularly just to keep things tidy. We attached the wand to our outside hose and brought it through the window directly across from the bathroom. We would suggest laying a towel done to catch any drips - something we thought of afterwards!